The moose is out in force, and the ground is covered in white. 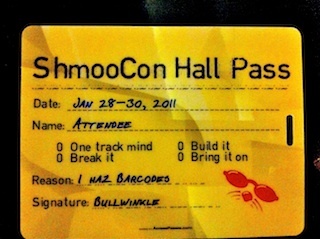 It's Shmoocon time again, and we're here to cause our usual stir. From an umbrella that looks like a Katana, to a grape soda delivering bomb disposal robot, heads are already turning. Registration was smooth, and we're less than 30 minutes away from opening talks. A lot of familiar faces, and a brief visit to ReverseSpace has this years geek fest off to a good start. Looking forward to the friends, the parties, the mindless goofing off, oh yeah and the talks too.